This entry was posted on Wednesday, August 4th, 2010 at 1:00 am and is filed under design, ubuntu. You can follow any responses to this entry through the RSS 2.0 feed. Both comments and pings are currently closed. > Stick with the stock GTK widgets. You’re almost right, but do not forget that the Gtk+ Control Widgets are really old fashioned. You can create a good-looking app using Styles but when you want open a file interactively then a really ugly old-fashioned widget will appear for you (OpenFileDialog). Also the AboutBox aargh, check the Firefox’s or Mozilla one and a real Gtk one. The Gtk one is opening a new dialog for licensing/contributor information and needs one more click and focus to an other dialog to close… I think such issues are the highest disadvantages of the Gtk+. I have been wondering for ages why the hell the Developers are designing the widgets’s look and feel (consistency, harmony, style, usability) and why not the Artists or real UI/Desktop Designers as at Apple. I think all of the control widgets (About box, GtkFileChooserDialog, Printerdialog etc.. etc.) should be redesigned. The Developers (I am a Programmer, but I know what I am capable for and the Design/Art is not part of it) can not do it as they should not talented at the Art. I am criticizing the Gnome/Gtk as a casual user and not as a Developer. I understand the problem but I don’t think having the title run over the artwork is a solution. It just doesn’t look professional, because it obscures the artwork. The basic problem is that you don’t have enough space to display all of the content you want. Reduce the amount of information you want to display. A reduced album title has no meaning if it is undecipherable. So in your quest to show the user all the relevant information you end up communicating less. That defeats the purpose! What should remain? I think the album picture should remain! Why? Because most likely, the user will identify the artist and album by looking at the picture alone! But, he can’t identify the song title by looking at the picture! So what should go? The artist and album title should not be displayed at all. Instead, the name of he song should be written out as far as possible. In case someone wants to know more, well, that could be a few clicks away. If there is no artwork available, well then you could use the additional space in order to display all of the information. Now, I haven’t read all the comments here. So, it is quite probable that someone else has already proposed this. Nevertheless: The idea is great! Keep up the great work, we ubuntuusers really appreciate it! PS: I hope the senseless fighting with red hat will eventually stop! It pains me to ask, but why would anyone think that it’s a good idea to have ARTWORK soiled by text running into it? The iPod can scroll song titles. Here, it should be possible, too. Make the menu a bit wider, reduce the font size of the song title. Done. the right of the existing controls. left of the prev/play/next control. The UI looks great..but as everyone is pointing out that ellipses don’t look good. I will suggest to show scrolling text. Agree with DG, wide screen -> wide menu, what’s wrong with making things simple? 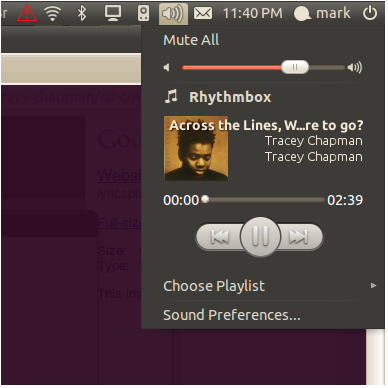 Just came across the direction of Ubuntu with those title bars. I couldn’t comment on the appropriate post so I’m doing so here. I’m a long-time Windows user, was researching the appropriate distro for me and my hardware, but as it turns out, these windicators are a disappointment. This might be surprising but as a Win user I minimize GUI elements a lot. For example I would remove the File/Edit/Etc menu bar from the software that permits this, or switch it vertical/left for others. I remove the status bar and everything. I use the mouse but also the keyboard. Anyway, today i think the more intuitive step in desktop design is to minimalize. For example, if the default behavior of double clicking the title bar was to maximize, then it would be good to remove the maximize control button from the wincontrols to leave only two buttons. For the windicators, I think it’s a pretty bad idea. It would be too much clutter to my eyes. Also each window having its own special icons… Is this OLPC or something? All in all they’re really not necessary, and even when done, the file/edit menu would still be necessary since these indicators will just cover a small functionality (thus having to add vertical space in the window). If you’re really persistent about this “feature” you can make it have the same behavior as the overlay status bar, or better, making those indicators viewable when the mouse actually points to the lower/upper right of the window in question (or something in this direction). Also for what’s _in_ those indicators, I think you’re just trying too hard to put anything just to convince yourselves. The cart/basket? you know I’ve never bought anything from the web, and mostly, I don’t think anything else than a browser would make use of that. Also I’d never share any file with anybody. Simply attaching files on e-mail. For the position of the wincontrols: I’m against placing the mon the left. It’s teh worse design idea. Making them easier to reach? More noticeable? Why in the first place! it’s not like I close my windows just after opening them. In fact making them be on the right side makes them visible only when necessary, and that’s the whole point I believe. I think that by this new design ideas you’re just trying to make ubuntu distinguishable from any other system without real gain in functionality or usability. You’re actually pushing the titlebar concept in even worse direction than where it already is. I’m sure I understand the excitement that some people already have in regards to these windicators. Reminds me of the hype of just the “web2.0” name. You really ought to review your design choices with more regards to the future. As for me if this will be forced onto the user without choice to disable, then I would definitely not make the switch to ubuntu but to a more reasonable distro. 2 – extend the ‘track navigation bar’ or whatever it s called so that people can scan through a track more accurately. Extending horizontally would also make some space to place the ‘mute all’ besides the volume control. Does it still have the unintuitive behaviour of the mouse scroll button not working for volume control unless your over the pop up? Mouse scroll volume control should work in 10.10, yes. As for the originally posted design, don’t left alight if no album art and right align if album art – it’s not consistent! Choose either Left or Right aligned. Don’t like the pause, rewind, fastforward buttons, esp because the middle is so much bigger – consistent sizes please! If song title is too wide to fit, don’t elipse it, expand the menu vertically or horizontally. Since I rarely use playlists, why do I have to have a playlist entry on the sound menu? – to be honest, I’d much rather have the old Rhythmbox icon back with it’s old functionality. I think the new sound indicator is a great idea. There is just one functionality missing for me: Switching the music from one output to another (pulseaudio). I think this is a common use case for many people (music in another room, skyping at the pc or switching music from the speakers to headphones). At the moment I have to use the pulseaudio volume control to do that. It would be great if there would be a field like the “Choose Playlist” field, where we can choose the output. A language note: rather than verbizing the noun and making up the word “ellipsize”, you might want to note that the verb “elide” already means what you want to say. Since I use Rhythmbox’s indicator applet to control my music (though I would appreciate some more options there) all I really want adding to the volume applet is… more VOLUME OPTIONS. If you MUST cram more functionality into the volume applet, why not add the ability to change individual application volume? Even if you insist on having track control in the volume menu, please add the ability to turn down ONLY the music. It’s a volume applet, please keep it’s features centered around that.